Dallas Police Department’s K9 Django has received a bullet and stab protective vest thanks to a charitable donation from non-profit organization Vested Interest in K9s, Inc. K9 Django’s vest was sponsored by Altrusa Club of Dallas Foundation, Inc. and embroidered with the sentiment “Vest provided by Altrusa Club of Dallas Foundation”. Vested Interest in K9s, Inc. is a 501c (3) charity located in East Taunton, MA whose mission is to provide bullet and stab protective vests and other assistance to dogs of law enforcement and related agencies throughout the United States. The non-profit was established in 2009 to assist law enforcement agencies with this potentially lifesaving body armor for their four-legged K9 officers. Since its inception, Vested Interest in K9s, Inc. provided over 3,000 protective vests, in 50 states, through private and corporate donations, at a cost of over $5.7 million dollars. 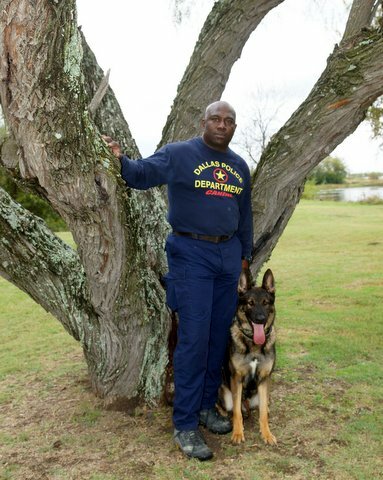 K9 Django of the Dallas Police Department’s K9 Unit will receive a bullet and stab protective vest thanks to a charitable donation from Vested Interest in K9s, Inc. K9 Django’s vest is sponsored by Altrusa Club of Dallas Foundation, Inc. Delivery is expected within eight to ten weeks. Vested Interest in K9s, Inc. is a non-profit organization located in East Taunton, MA whose mission is to provide bullet and stab protective vests and other assistance to dogs of law enforcement and related agencies throughout the United States. They were established in 2009 to assist law enforcement agencies with this potentially lifesaving body armor for their four-legged K9 officers. Since its inception, Vested Interest in K9s, Inc. provided over 2,400 protective vests, in 50 states, through private and corporate donations. All vests are custom made in the USA by Armor Express in Central Lake, MI. For more information or to learn about volunteer opportunities, please call 508-824-6978 or you can visit their website at www.vik9s.org. The Dallas Police Department would like to thank Vested Interest in K9s for their generous donation to Django.